After failing to win in two, Arsenal dispatched Fulham 4-1 in their last League fixture to get back in the hunt for top four. However, their resilience and progress will further be put on the scale when they travel away to West Ham in the Saturday Lunch time kick-off. West Ham seemed to be improving but are currently on a two game winless run that was compounded by a 2-2 draw with Brighton last time out. Former Arsenal star, Samir Nasri is set for his first Premier League appearance since August 2016, after making his West Ham debut in the FA Cup win against Birmingham. Marko Arnautovic’s participation is in doubt amid claims he wants to move to China, while Fabian Balbuena is out for eight weeks following knee surgery. Mesut Ozil, Laurent Kosciely and Hector Bellerin are among the six Arsenal players available after injuries. Shkodran Mustafi and Nacho Monreal are also fit and in contention. Fellow defender Konstantinos Mavropanos has overcome a groin problem. West Ham have won just one of their last 21 Premier League matches against Arsenal (D4, L16). That sole victory came in August 2015. The Gunners are unbeaten in 11 away matches at West Ham in all competitions since November 2006 (W8, D3). Unai Emery’s first victory as Arsenal head coach came in this season’s reverse fixture. The Hammers have lost 29 Premier League matches against Arsenal, more than against any other side. Having gone two games without a win, all eyes will be on Liverpool, to see how they respond. In their last league fixture, they lost 2-1 to Man City, a result that saw Liverpool’s lead atop the standings cut to 4 points. 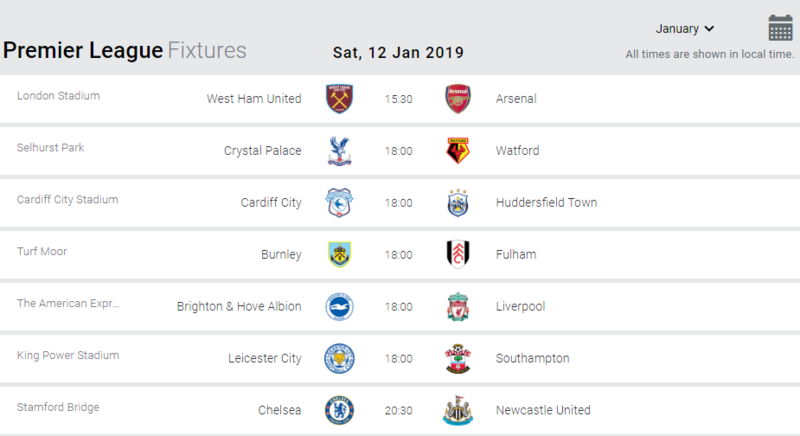 Against Brighton, a chance to retain their 7 point caution presents its self although Jurgen Klopp and his charges will have to take nothing for granted as the Seagulls have lost only two home games all season so far. Brighton are again without defender Bernardo, who suffered a hamstring injury against West Ham on 2 January. Alireza Jahanbakhsh, Jose Izquierdo and Mat Ryan also remain unavailable. Virgil van Dijk will return for Liverpool after missing Monday’s FA Cup defeat at Wolves, but the Reds remain short of centre-back options. Dejan Lovren is out with a hamstring injury and Joe Gomez is still unavailable, so Fabinho could again play in central defence. Joel Matip has returned to training following a fractured collarbone and will be monitored, as will midfielder Jordan Henderson, who has been nursing a calf problem. A host of key players rested against Wolves will be recalled to the starting line-up. Brighton have lost their last six matches against Liverpool in all competitions. The Reds have won all three Premier League meetings, scoring 10 times and conceding just once. Liverpool have never lost away at Brighton in the top flight, winning twice and drawing three times. Those five games have produced a total of 25 goals – 16 for the Merseysiders and nine for the Seagulls. Burnley are hopeful that at least one of Matt Lowton or Phil Bardsley will be fit after both full-backs missed out last weekend because of minor injuries. Johann Berg Gudmundsson is doubtful, while Aaron Lennon remains sidelined and Robbie Brady is suspended. Fulham defender Alfie Mawson is ruled out because of a knee injury. Manager Claudio Ranieri will revert to his first-choice starting line-up after making six changes for last weekend’s FA Cup defeat by League Two Oldham. Burnley are unbeaten in their last 29 home matches against Fulham in all competitions (W24, D5). Fulham’s last win at Turf Moor was 2-0 in the top flight in April 1951. Cardiff’s Danny Ward is set to miss out after suffering a blow to the head last weekend, while Kenneth Zohore is not ready to return from a thigh problem. Forward Rhys Healey is in contention after returning from a loan spell at MK Dons, but winger Kadeem Harris is struggling with a shoulder injury. Christopher Schindler returns for Huddersfield after suspension. Jason Puncheon, on loan from Crystal Palace, is set to make his league debut for the Terriers. The game comes too soon for Tommy Smith, while Aaron Mooy, Danny Williams and Abdelhamid Sabiri also remain out. Cardiff City are unbeaten in their last 10 matches against Huddersfield Town in all competitions, winning seven. The Terriers have lost their previous six games away to the Bluebirds in league and cup, Huddersfield’s last win against the Welsh side was a 1-0 victory in the third tier on 25 January 2003. Their manager for that game was Mick Wadswoth, who had been sacked days earlier only for the club to reinstate him after realising they could not afford his pay-off. The Terriers have had a player sent off in each of their last two matches against Cardiff: goalkeeper Danny Ward in May 2017 and Jonathan Hogg in August 2018. Crystal Palace forward Christian Benteke could be involved for the first time since 1 September after recovering from a serious knee injury. Pape Souare faces a two-month absence with a dislocated shoulder. Watford pair Andre Gray and Christian Kabasele have returned to full training after injuries. Gray has missed seven games because of a leg injury, while Kabasele has been absent since he collided with a post in the Boxing Day defeat by Chelsea. Sebastian Prödl, who has a knee injury, is the only player unavailable to head coach Javi Gracia. Crystal Palace have won this fixture at Selhurst Park for the past two seasons and could equal their longest Premier League home winning streak against a single opponent, having beaten Stoke three times in a row. Watford could win both league meetings in a season for the first time since 2001-02 in the second tier. Winger Harvey Barnes could be involved for Leicester after being recalled from a successful loan spell at West Brom. Jonny Evans faces a spell on the sidelines after suffering a broken toe. Southampton are without three strikers: Danny Ings and Michael Obafemi have hamstring injuries, while Charlie Austin begins a two-match ban. Pierre-Emile Hojbjerg continues his four-match suspension, Ryan Bertrand is out with a back problem and Maya Yoshida is away on international duty. Leicester have won two of the past three Premier League meetings, and also beat Southampton on penalties in the League Cup in November. Saints have failed to win any of their last five league visits to Leicester (D2, L3). The last three meetings in all competitions at the King Power Stadium have ended 0-0. Chelsea have been blowing hot and cold lately and were left disappointed when they drew 0-0 at home to Southampton last time out. At the start of the day, Mauricio Sarri’s side sit 10 points adrift of top spot and with the games coming thick and fast, they will know there is no room for error. Alvaro Morata is an injury doubt for Chelsea, having missed Tuesday’s League Cup semi-final against Tottenham because of a minor hamstring problem. Ruben Loftus-Cheek remains out with a back injury, while Cesc Fabregas will not be considered ahead of his likely move to Monaco. Newcastle’s on-loan winger Kenedy is ineligible to face his parent club. Jonjo Shelvey, Paul Dummett and Karl Darlow are all injured but Federico Fernandez and Ciaran Clark are fit. Chelsea have won the last six times they have hosted Newcastle in all competitions. They have lost only one of their 23 home Premier League games against Newcastle (W16, D6) – a 2-0 defeat in May 2012. The Blues won 2-1 in the reverse fixture earlier this season. Everton have no new injury concerns, with Ademola Lookman in contention for just a second Premier League start of the season after scoring in the FA Cup win over Lincoln City. Left-back Lucas Digne is expected to return after being rested last weekend, along with Andre Gomes and Richarlison. Bournemouth have a host of injury concerns, with Callum Wilson, Joshua King and Ryan Fraser all doubts. Dominic Solanke has been ruled out until February with a hamstring injury. Everton have won all three of their home Premier League matches against Bournemouth. Bournemouth have lost all five of their competitive away fixtures at Everton. Man United have been flying since the appointment of Ole Gunner Solskjaer, winning all of their last four League games. However, none has come against a top 10 side. The visit to Wembley will put their progress under scrutiny as the challange that lies ahead of them is in-form of one of their rivals. For Spurs, they sit only six points behind leaders Liverpool and if they are to win a first major title under Mauricio Pochettino, they need a huge statement in form of defeating United on Sunday. Tottenham will welcome back a raft of first-team regulars, having made eight changes for the FA Cup win at Tranmere. Eric Dier is still out following appendix surgery and Lucas Moura is an injury doubt, but Mousa Dembele and Jan Vertonghen are back in training. Paul Pogba is set to be available for Manchester United after he missed the FA Cup third round with a leg problem. Eric Bailly remains suspended, while Chris Smalling could miss a seventh straight game because of a foot injury. Marcos Rojo has returned to Argentina to continue his rehabilitation. Spurs could win three consecutive top-flight meetings with Manchester United for the first time since 1960. United have lost their last three Premier League matches at Spurs, having been defeated just three times in the previous 23 games (W12, D8). The two sides have scored 40 goals between them in their last six matches in all competitions. Sergio Aguero and Vincent Kompany could be back in contention for Manchester City. The pair missed the cup games against Rotherham and Burton, striker Aguero through illness and captain Kompany with a muscular problem, but are close to fitness, although Guardiola was unsure about their availability on Friday. Midfielder Fernandinho is expected to return after being rested for both cup matches but left-back Benjamin Mendy (knee) and goalkeeper Claudio Bravo (Achilles) are still out. Wolves have no fresh injury concerns. Rui Patricio, Matt Doherty and Romain Saiss are expected to return after being rested for Monday’s win over Liverpool. Diogo Jota may lose his place to Ivan Cavaleiro after a below-par return against the Reds following almost a month out with a hamstring problem. Manchester City have won five of their last six home top-flight meetings with Wolves (D1), since a 2-3 defeat in December 1979. Wolves have picked up one win in their last 10 matches with Man City in all competitions (D3 L6), a 2-1 win at Molineux in the Premier League in October 2010. Manchester City are unbeaten in their last 34 home Premier League games against newly promoted sides (W30 D4) since a 0-2 defeat to Reading in February 2007 under Stuart Pearce. Manchester City haven’t kept a clean sheet in any of their last six Premier League home games, their longest run without one at the Etihad since a run of eight ending in December 2015. Manchester City have scored at least twice in each of their last 12 Premier League home games. Only four teams have ever had a longer such run, most recently Man City themselves between September 2017 and February 2018 (13). Wolves have lost seven of their last eight top-flight games played on Monday (W1), including all three such games in the Premier League. Wolves have won nine points from their seven games against ‘big six’ sides this season (W2 D3 L2), more than any other side outside of those six clubs. Wolves are one of only two clubs in Pep Guardiola’s managerial career he has faced more than once but never beaten (P2 W0 D2 L0), along with Celtic.